Pluck 'em clean. Pluck 'em fast. 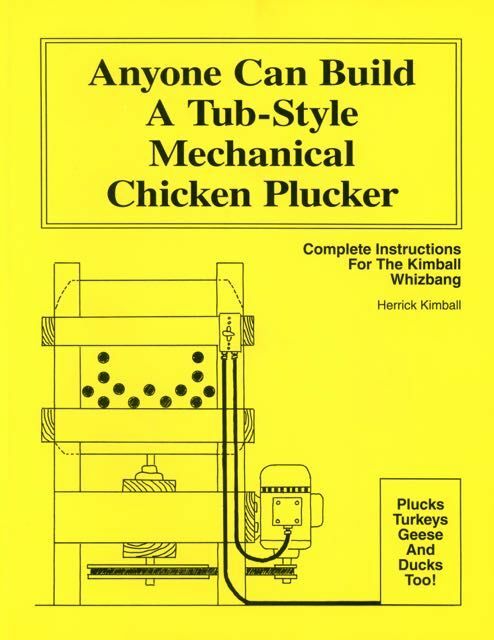 Pluck 'em easy with your own homemade Whizbang chicken plucker. This book tells you how to get the job done... step by step. Thousands of Whizbang chicken pluckers have been built . You can do it! This is a scanned copy of the 7th Printing of the book in pdf file (18MB) that you download to your computer. I am making this available primarily for buyers outside North America because the cost of shipping is so much extra. If you live in the US, you are welcome to purchase this download but I strongly recommend that, for a few extra bucks, you buy the actual book. Maybe I'm just old-fashioned, but when it comes to a how-to book, I like to have real pages I can flip through and jot notes on. For US buyers, the paperback version is only $4 more (postage paid). For those who don't already know, the Whizbang chicken plucker will pluck all the feathers off a chicken in 15 to 20 seconds. You simply scald the bird, flip a switch, drop it in the tub, and watch the machine do all the dirty work. To learn more (lots more) about the amazing Whizbang plucker, simply CLICK HERE NOW. You can also purchase a paperback copy of the book at that link.